For additional information about this book, contact us. 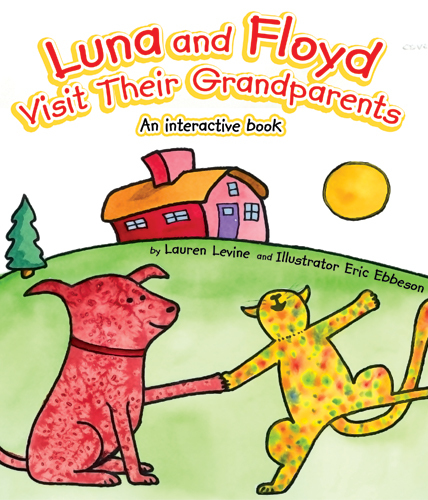 Luna and Floyd is about a dog and cat’s adventurous trip to their grandparents. The book is designed for children ages 1-3, although older children will enjoy the book too. It is uniquely interactive in that there is a physical action on each page that corresponds to the story. The actions can be done as your child sits on your lap. For example, when Luna washes her hair, you rub your child’s head. When the characters walk up a big hill, you walk your fingers up your child’s back. You rub your child’s tummy as Luna and Floyd eat lunch with their grandparents, and when they finally return home at the end of their journey, you and your child high-five, just as the characters do in the book. As you can see, this book is a way to read and play with your child and is as much fun for you, the reader, as it is for your child!